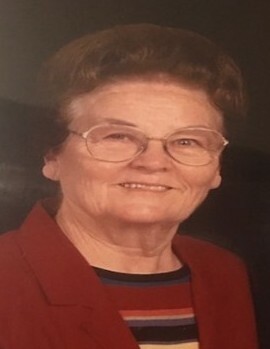 Margaret Hughes Barber, 87, of Goldsboro completed her earthly assignment as a prayer warrior and met her Lord and Savior on Wednesday, April 10, 2019. Margaret was born August 9, 1931, in Wayne County to the late Henry Hughes and Beatrice Wade Hughes. She was married to the late Lynn Eugene Barber, Jr. in 1948 and remained married to him for 56 ½ years. She was a hard worker on the farm, in the church, and at her workplace. She farmed along with her husband, the late Lynn E. Barber, Jr. until all her children started school. She then went to work and retired from RG Barry Corporation where she served as a line supervisor. A lady of strong faith, Margaret was a longtime member of Clingman Street Church of God and then United in Christ Church. She served her Lord faithfully in a variety of roles such a choir member, Sunday School teacher, and Ladies Ministries. For Margaret, everything revolved around her family and their well-being. She always lived a Christ like example to her family. She believed that you could accomplish anything that you were determined to do. Her family has many fond memories of times gathered around the family table for Sunday lunch. Margaret enjoyed her time working in her flowers, traveling with family and friends, especially her late sister Kathleen Thornton. She loved sports and enjoyed watching her children and grandchildren participate in various sports and activities as they were growing up. She was also an avid Carolina Tarheels fan. Margaret also enjoyed fishing and spending time at North Carolina's Crystal Coast. A service to celebrate Margaret’s life will be held Sunday, April 14, 2019 at 6 p.m. at United In Christ Church, with the Reverend Ira Williford and Reverend Kenneth Boyd officiating. The family will receive friends immediately following the service. A graveside service will be at Wayne Memorial Park on Monday April 15, 2019 at 11:00 a.m.
Margaret is survived by her three children, Beverly Barber Phillips and husband, Greg, and Sharon Barber Wilson and husband, Rocky, Lynn Barber and Pamela Davis; six grandchildren; Shannon Phillips, Keri Phillips Brooks and husband, Chevis; Adam Phillips and wife, Shannon; Coral Barber Clark, Abbey Barber Mercando and husband Tony; Hunter Dentzer; step grandchild, Skylar Wilson. She also has five great-grandchildren; Cole, Avery, Miles, Cohen, Davis, and Brody who will be born this month. In addition to her husband and parents, Margaret was preceded in death by a brother, Gerald Hughes and a sister, Kathleen Hughes Thornton. The family would like to acknowledge the staff of Kitty Askins Hospice Center, Helping Hands Family Care as well as the friends and health care professionals who had a profound impact on the quality of their mom’s life during her illness. Arrangements are entrusted to Howell Funeral Home & Crematory in Goldsboro.